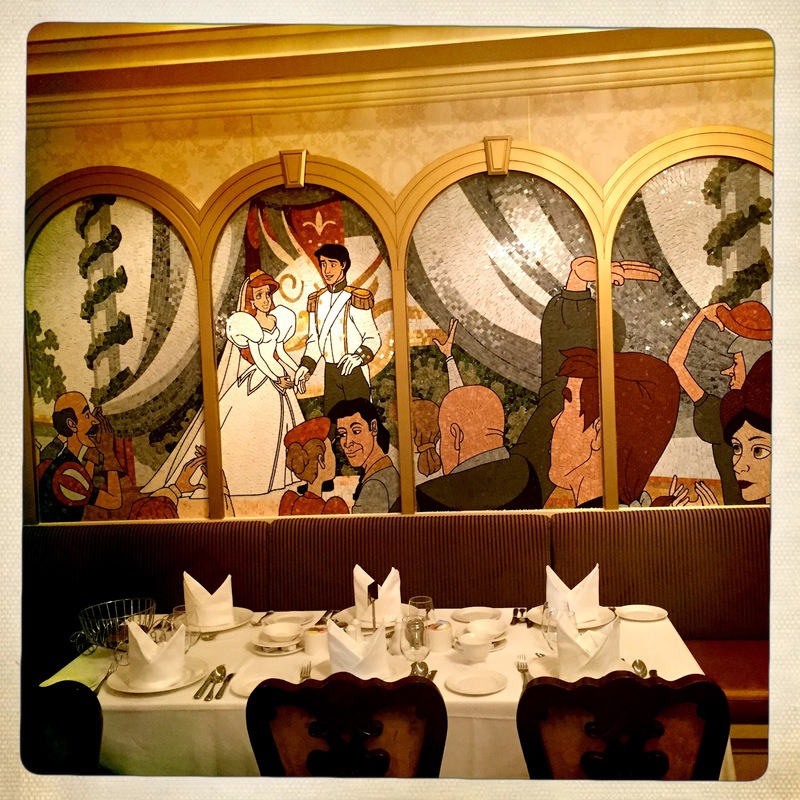 As part of each Disney Cruise Line ship there are three rotational dining restaurants. These restaurants vary in theme from ship to ship, with some translating better than others. 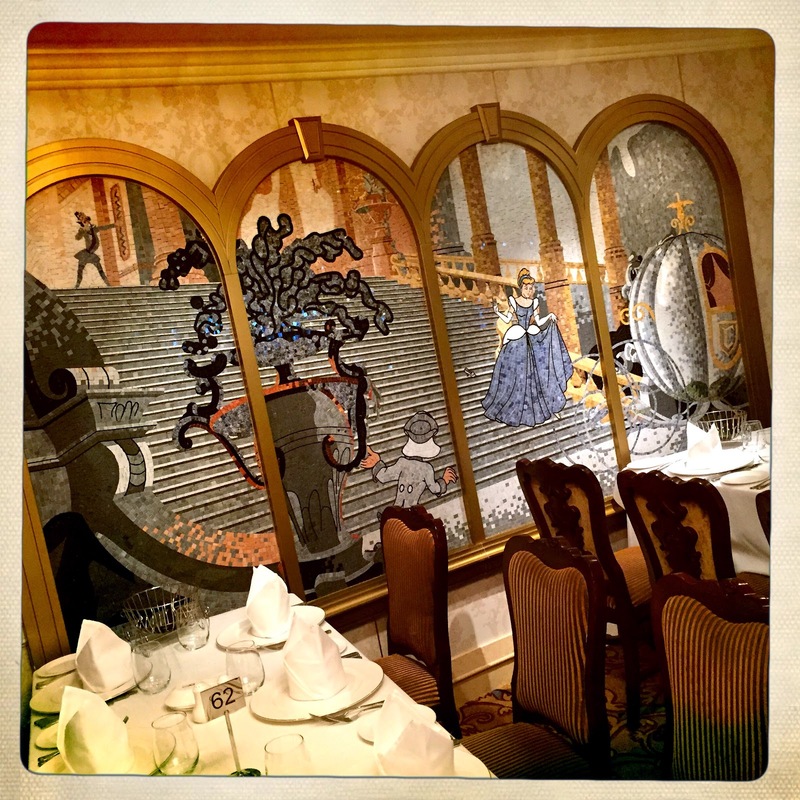 One of the prettier restaurants in the fleet is Royal Court on the Disney Fantasy. 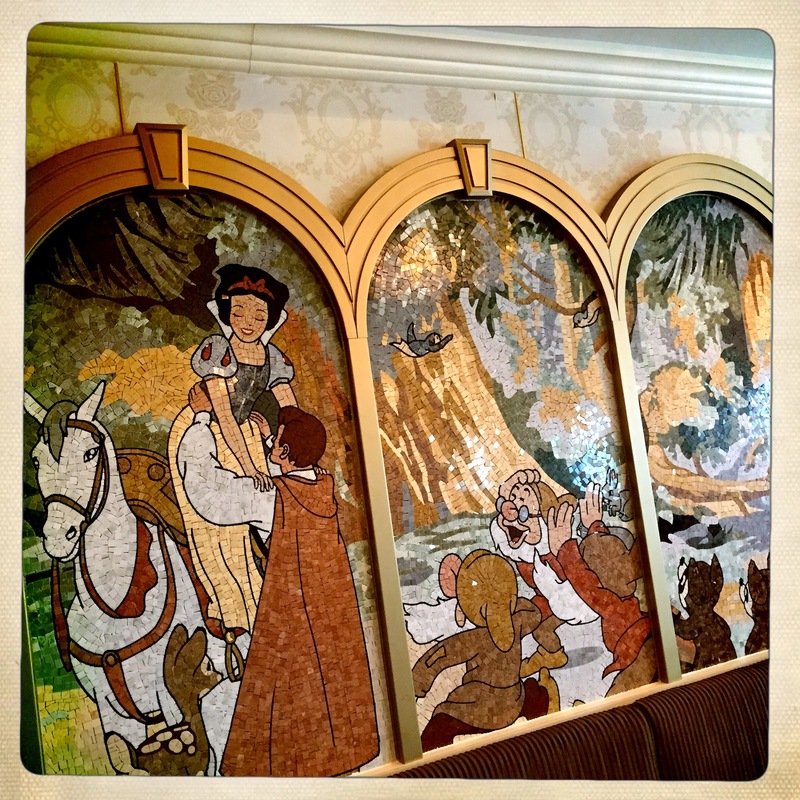 This restaurant is supposed to be the "fancier" of the three, and while this normally would be a disaster in theming Royal Court almost gets away with it. Seriously though, when has Disney actually pulled off "fancy"? Even our beloved Victoria & Alberts has an ultimate long island iced tea on the menu. 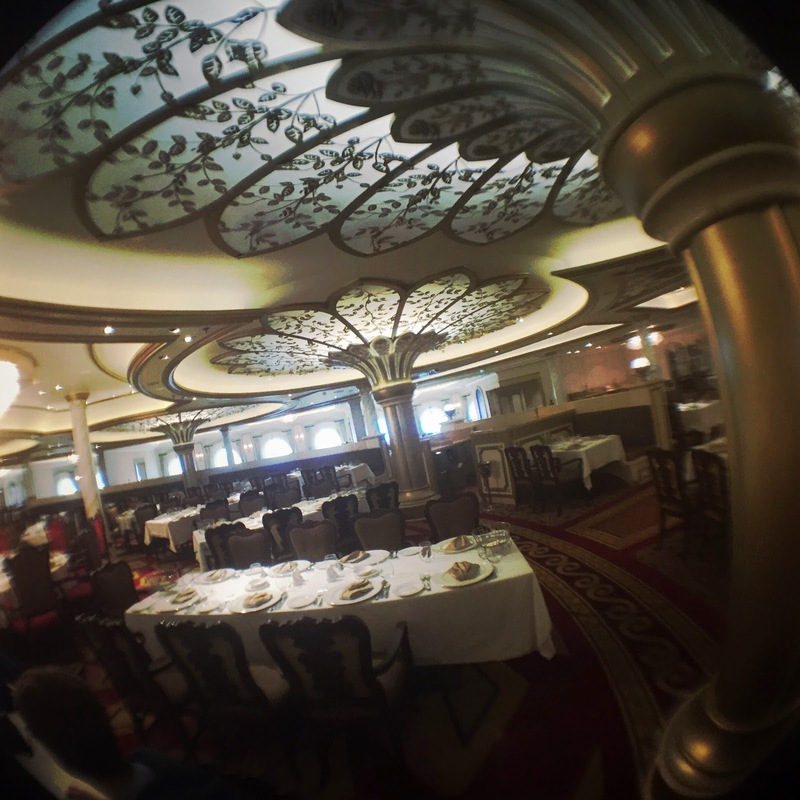 The restaurant is located on deck three midship, just past the iconic Minnie Mouse statue and right in the middle of the ships activity. Royal Court is rich with warm inviting colors of gold and beige which makes dining there the most pleasant of the three. The other two are fine but much more obnoxious. 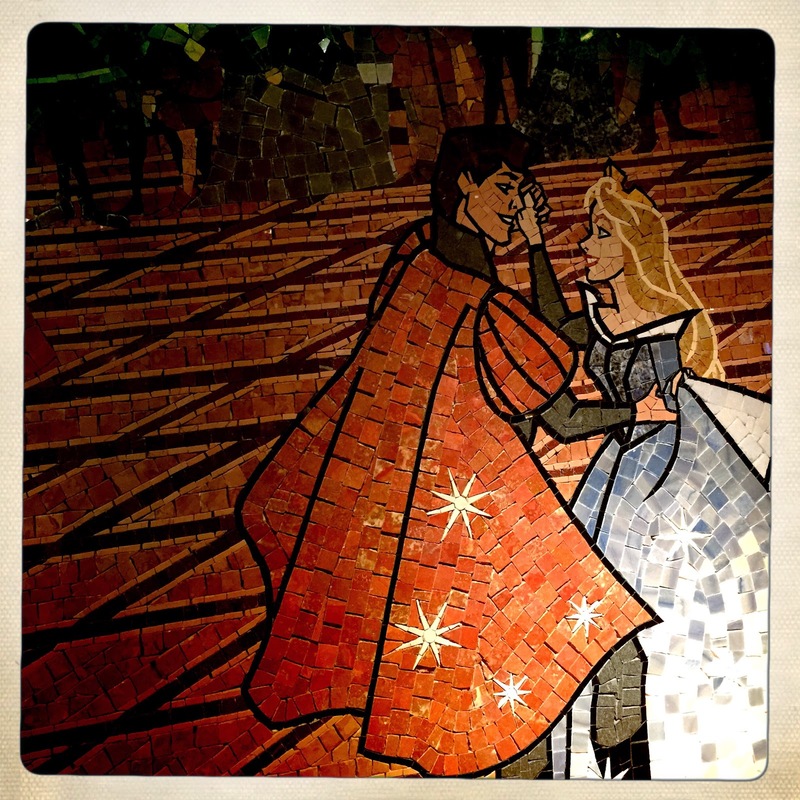 You know I'm not the type to want Disney characters (especially princesses) thrown in my face at all times while at Disney World...or on the ships for that matter. However, when done subtly and SOMEWHAT tastefully I can deal with it. This is the case of Royal Court, which integrates a few very pretty mosaics. I appreciate these because they actually bring some visual interest to the restaurant, which is mostly lacking in artwork. (there is a notable unfortunate exception...) Sticking with the color palate of the restaurant, the shades of tile are soft and muted. 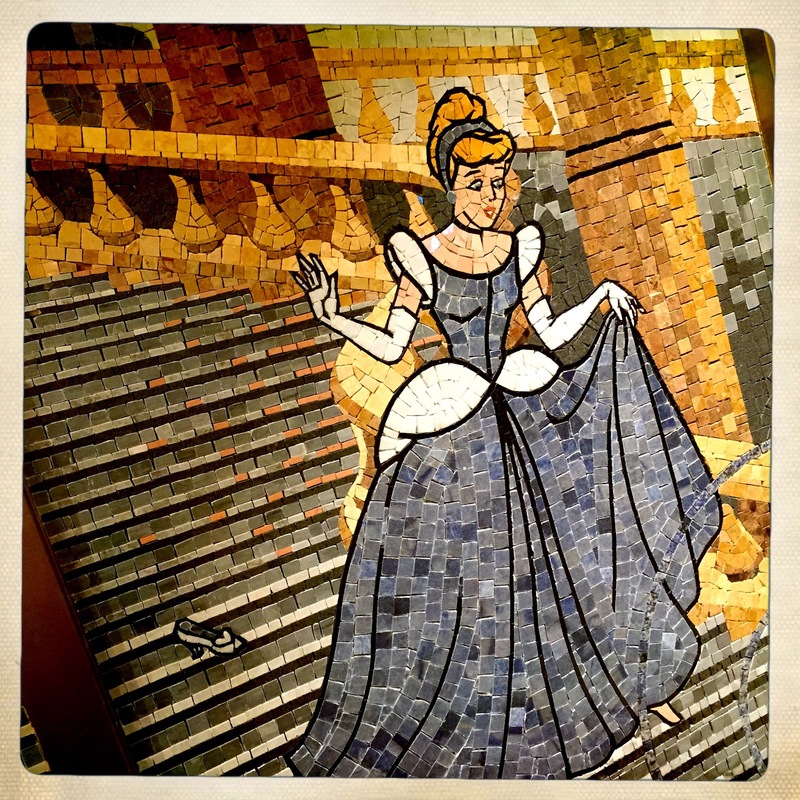 These mosaics aren't shoved in your face, and I really love that. The three good fairies are perfect. 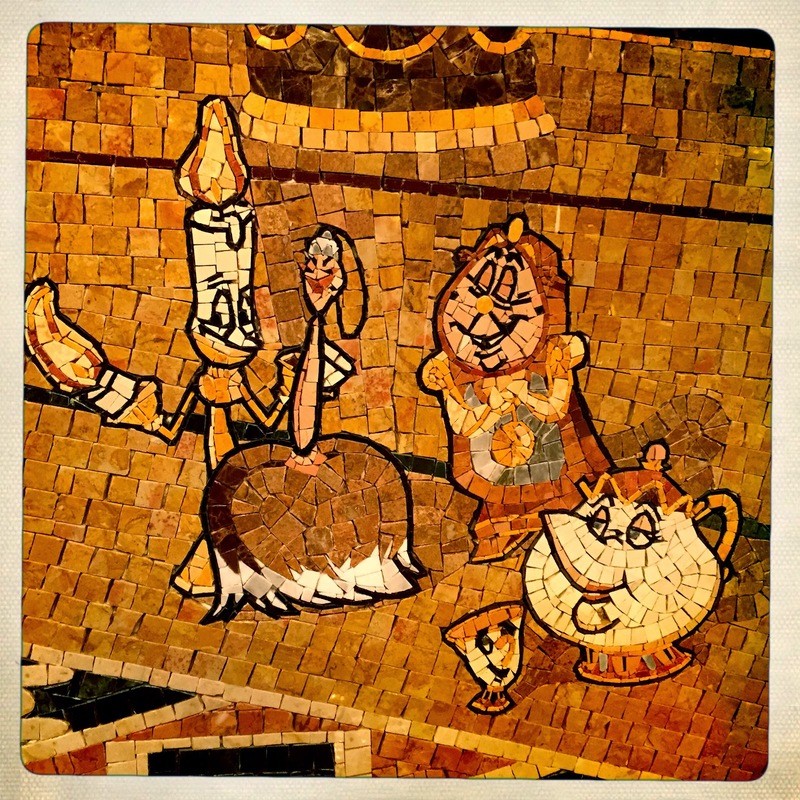 I love this, because Mrs. Potts looks as drunk as she is in the movie. Composition wise, the tile work isn't phenomenal. 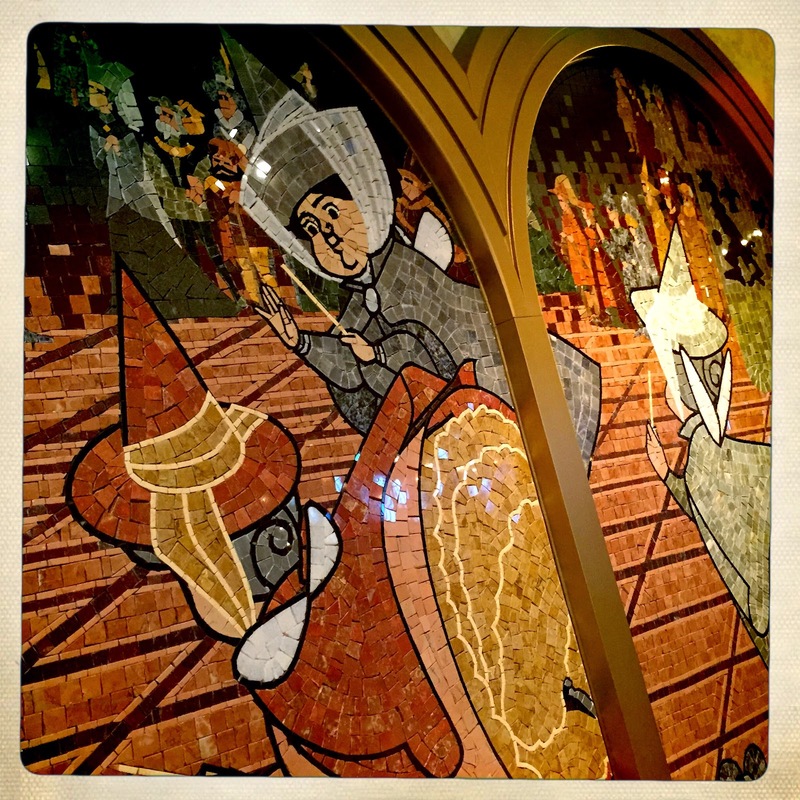 I think the Little Mermaid mosaic is particularly awkward. The sense of proportion is completely out of whack, and the execution of the raised hands is horrifying. Plus there is someone in the crowd who also resembles Prince Eric, so thats just lazy design choices. 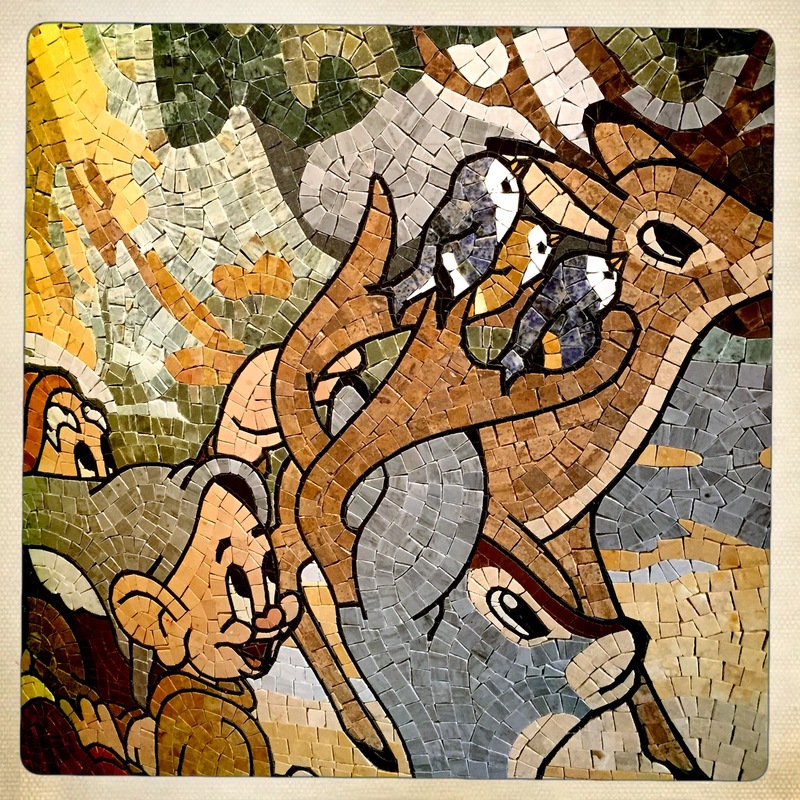 An exception to the slightly awkward layout is the Snow White mosaic. This is by far the most charming and subtle of the panels. I love the abstract scenery of the forrest and the palpable delight of the dwarves. This image portrays the feel of its movies best. Pretty right? 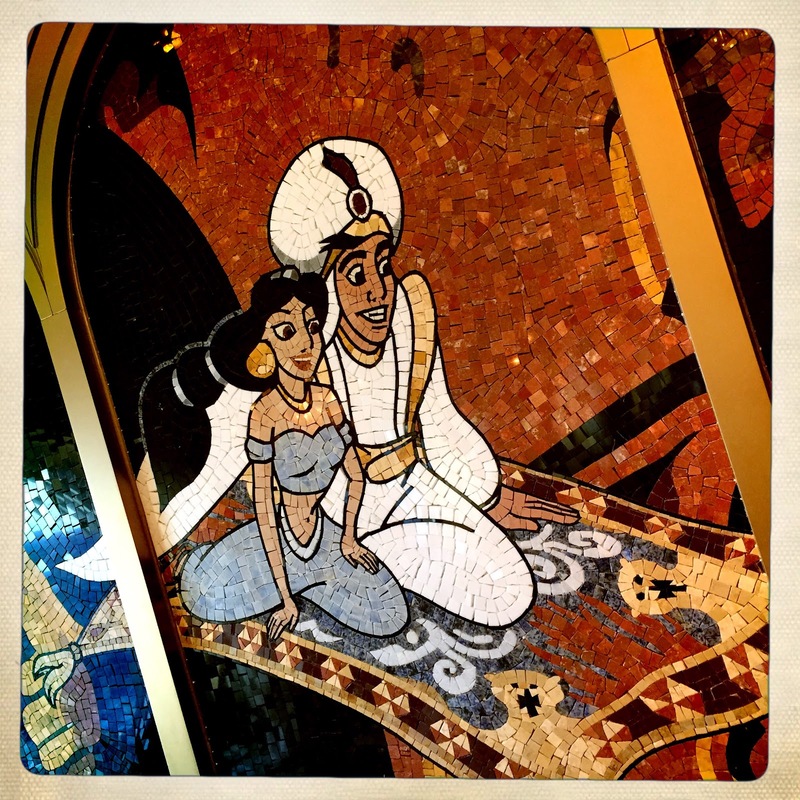 As far as Disney characters in a "nicer" restaurant these aren't that bad. 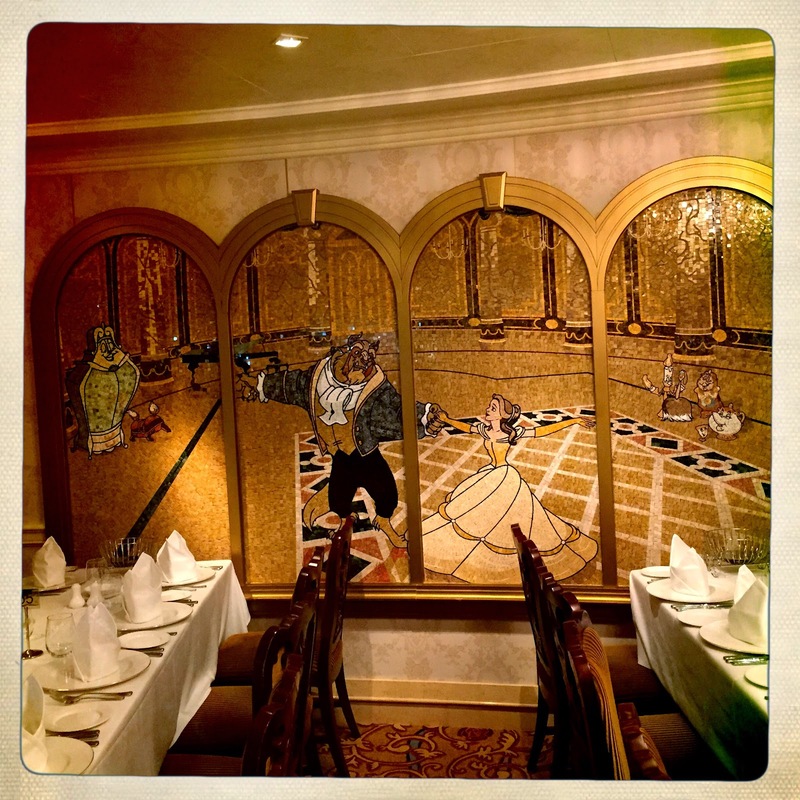 Because they are set back into the recesses of the restaurant they mostly add a nice texture to the walls, with slight pops of color here and there. Royal Court actually gets a passing grade on decor...which three weeks ago I probably wouldn't have believed. 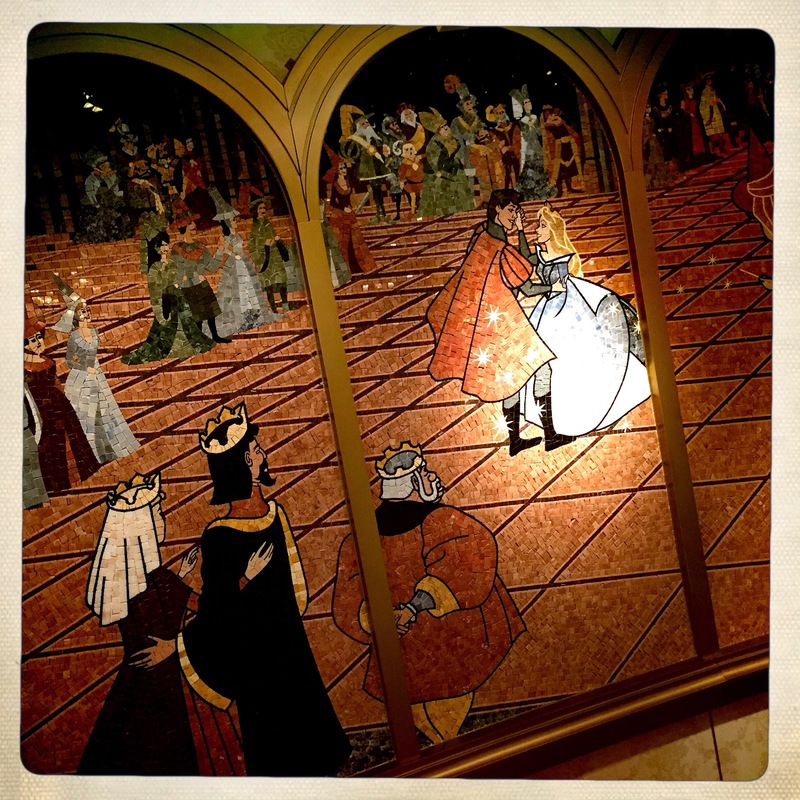 Have you ever been on the Disney Fantasy? What was your favorite restaurant? Let us know over on Twitter or Facebook! Or better yet...tag us in a photo of you on the ship on Instagram!